Kahlil Gibran wrote "You give but little when you give of your possessions. It is when you give of yourself that you truly give." And perhaps it's appropriate to quote Gibran's The Prophet when talking about French-born actor Reda Kateb, who embodies at once cultures as diverse as Algerian, Czech and Italian. If you are not familiar with Kateb's name yet, you will be. I believe he's about to become the most sought-after actor in world cinema. But back to generosity and Kateb. The two seem to go hand in hand, as the actor dedicated his time and energy to answering thoughtfully each and every question posed by a roomful of journalists who simply couldn't get enough of his wisdom. Kateb gave of himself, on a sunny but frigid afternoon, when one could tell he'd been doing press all day for Étienne Comar's Django -- this year's opening film at the Berlinale. Coming back from a break just outside, on the balcony of the suite in the Scandic Hotel, he excused himself by saying "if I give twice the same answer you'll forgive me," clearly tired from the day-long junket he'd been a part of. Yet once the questions started, Kateb was there, in the moment, present and giving, never holding back, always being sincere. And he never repeated himself. 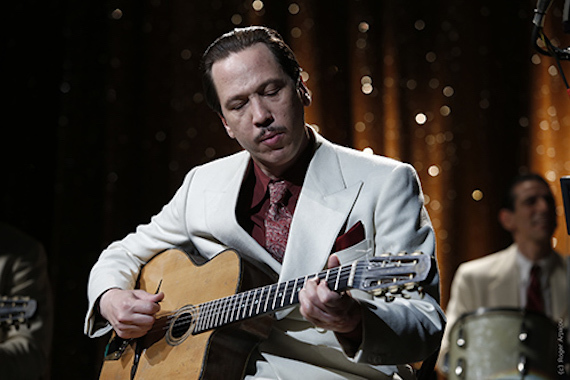 Watching Django, I realized Kateb's Django Reinhardt redefined courage for me. His languid, truthful way of embodying the legendary Gypsy guitarist redefines an iconic figure and from now on, I'll never be able to listen to Django's music again without seeing Kateb's face. That face, so understatedly yet powerfully handsome, the way he smiles, also lacking any sign of self-importance, Kateb embodies true beauty. His sultry gaze and quiet passion, the kind you feel bubbling just below the surface, make Django irresistible and from a character in a film and a musical figure in our collective imagination, Kateb turns him into a real man right in front of our eyes. There is also a playfulness to Kateb that sneaked out a couple of times during the interview, a break from his otherwise disciplined persona. At the start, he pulled a bright red guitar pick out of his pocket and started twirling it around in his fingers. When he accidentally dropped it, while his translator turned his French answers into English, he reached down to the floor and searched for it under the table. It made me giggle while I transcribed his thoughts later, giggle out loud at the thought of him searching for his red guitar pick, with the help of a journalist sitting to his left. Interviewing Kateb made me wish my work for the day could end there. You know, when you've experienced the best and nothing could possibly top it? That's how I felt and I don't remember actually walking back to my hotel from the Scandic. But I remember crossing gaze with a few of my fellow human beings and finding new beauty in them. When a film, a star, a meeting can do that, I say it's cinematic magic. What is it like to do press all day? Does it get to be very surreal at this level? Reda Kateb: Not surreal, but one tends to get tired. How do you approach a genius that actually lived and still make the part your own? Kateb: Right from the moment I read the script, and I knew very little about Django, I felt that I will have to look for a character that was much bigger than me, and almost bigger than life. Exactly like the great characters that you get in theater who are in a way some concentration of humanity. They are very full and very complex. And this is how I felt with Django. So it really was a challenge for me to understand who this character was that I will have to play. It was like having to go up a mountain really. The preparation work lasted for a year and when Etienne Comar was about to start shooting I required a little more time in order to prepare better because I didn't feel I was ready. When the shoot started lets say maybe the first week, I was trying to adjust and find out how I was going to do, but then after a week it was perfectly OK and I was ready to let go. When I put on my costume, I was Django. Was it difficult to communicate in a different language in this film? Your language is acting whereas in this film you are using music so much to communicate what you are feeling, and who you are. Kateb: I have a musical relationship with acting. And this for each part, I really find it has to do with the rhythm you give and it's some kind of music, and I absolutely love acting in another language. Last year I shot a film with Wim Wenders where I spoke in Somali and obviously I absolutely ignore the Somalian language so every morning and every night I was learning my lines, phonetically. My approach of the language was not any more something that had to do with the meaning of language, it was an approach that had to do with the vibrations, with the way the voice can actually be an instrument. I felt that when you are liberated from the meaning, you are as close as possible to the animal vibration that you feel when you speak. 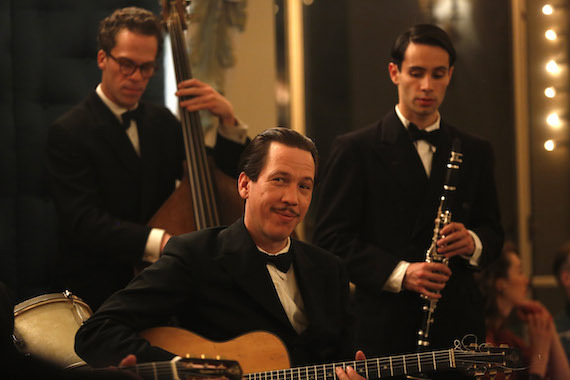 In a way we actors we do some kind of interpretation with an instrument, which is the voice, and my real preparation for Django was the musical preparation that lasted a year and this really was my gateway to the character. How well did you learn to play and how much of it is in the film? Kateb: The preparation lasted for one year so I played every day and during that year I shot two other films but I always had my guitar with me in my dressing room and I was playing, I was doing my scales. I started with simple tunes like some Bob Dylan music and then little by little I started playing with this three-fingers technique and I did exercises with rhythm. This is what I worked on for the film. What was most important for me was that other musicians watching the film should believe that I was the one playing. As I also wanted audiences of Gypsy origin to really believe that I was a Gypsy when they would watch the film. This was my challenge and what I concentrated on. When we see guitar playing, is it always you doing it or is it a double? Kateb: For the close-ups they are the hands of someone called Christophe Lartilleux but for any kind of wider shot it's really me. Are you interested in the obvious political resonance of the film? Kateb: Anytime I do a film I need to agree with the viewpoint, the stance of the film. To me the film was a way of paying homage to the grand icon of Gypsy music and also to the Gypsy community. It was also speaking of a specific period and it was in 2016 in France that the genocide of the Gypsy people was recognized so in a way it was my opportunity to take part in telling a history that was not necessarily in the textbooks. You can also see the film as the story of a family of refugees who would need to cross a lake in order to survive and obviously if were to see what this lake could be nowadays it's quite obviously the Mediterranean. It was for me important that the film not be merely some kind of historical postcard but to resonate with the bigger picture in our days. The film is not a statement, it does not deliver any kind of message. It is more a work of art that actually puts forth emotions and could enable the viewer to feel and maybe then start thinking. It's inevitable to watch the film and draw comparisons with what is happening around the world, in the USA and specifically in France. Would you like to share your opinion about what happen in France if Marine Le Pen wins? Kateb: How can I say this. First of all, I feel more like a citizen of the world, and I don't want to come here and deliver some kind of view on French politics. I think it's a global movement. In a way we are sort of going backwards. The world is becoming more right-wing orientated and it seems that people are in some sort of need for strong or dictatorial political figures. This is something that I can see, like many of us, and something that I find rather worrying -- as many of us do. But I don't think the question is whether it will be Marine Le Pen or François Fillon, I think the question is more about -- and this is something that has lingered in my mind for a long time -- is it a particular time that creates the great political figures or do great political figures exist and then are they going to shape the times, the era? I think it's the first that actually happens. There are moments in history that call for a certain type of figure and I think our times call for the type of more right-wing dictatorial figures. But having said that I think it's important to have a film that actually pays homage to a people without borders, who know no frontier, people who in a way are not money-oriented, who live their lives almost poetically and artistically, and I think this kind of film in our days is extremely necessary. I think it's a strong symbol to have it open the Berlinale. Django, first refusing to play for the Nazis, then accepting. How do you relate? Kateb: I imagine that some right-wing people may have bought some tickets to my films and as such, contributed to the funding of the films. Actually I doubt they are very numerous because the films I've made are not likely to interest these kind of people, but anyway I think like Django, if I were performing in a theater I certainly wouldn't ask the people what are their political views. Anybody can actually decide to buy a ticket to see a show or a film or to buy a record. You can't prevent people from coming to see you. But as an artist you can decide to align with, or to support some politician or some political party, and then you have to realize that this may have some consequences. This is where the line is drawn. As a citizen I would certainly like people like Marine Le Pen not to exist, but the question about political commitment of artists is a question that you should really ask yourself. I did a lot of research about how artists behaved during the Nazi occupation in France, and some of them like Django just carried on, kept doing their jobs, as did bus drivers, because they needed to survive. Others were actually far more involved with the Nazis. They went and shared dinners or lunches with them or did publicity, like Fernandel did on Radio Paris. This is where you can draw the line between what it is to carry on doing your job and collaborating. But it's always difficult to judge people, to imagine what you could have been doing in this difficult period. I know for myself I certainly would not have been able to -- even if it was something that could help my career -- collaborate with this kind of regime. Photos by © Roger Arpajou courtesy of Berlinale, used with permission.